If crutches are difficult to use, this steerable knee walker (also known as a knee scooter) will assist in providing mobility to anyone who is recovering from foot surgery, breaks, sprains, amputation and ulcers of the foot. 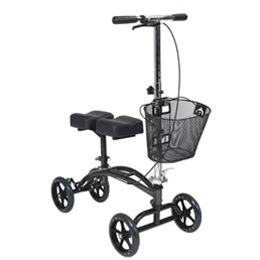 This 4 wheeled, steerable knee scooter comfortably supports the injured leg with an adjustable height knee pad and is propelled using the good leg. Two-piece padded leg pad provides comfort. Handle height range 31" - 40"
Unit Dimensions 16" - 30"
Knee Pad Height 16.5" - 20.5"
Pad Dimensions 7" x 15"